If this card is sent to the GY as Synchro Material: You can Special Summon 1 “Rose Dragon” monster from your hand or Deck, except “Red Rose Dragon”, then, if it was sent for the Synchro Summon of “Black Rose Dragon” or a Plant Synchro Monster, you can also add 1 “Frozen Rose” or 1 “Blooming of the Darkest Rose” from your Deck to your hand. 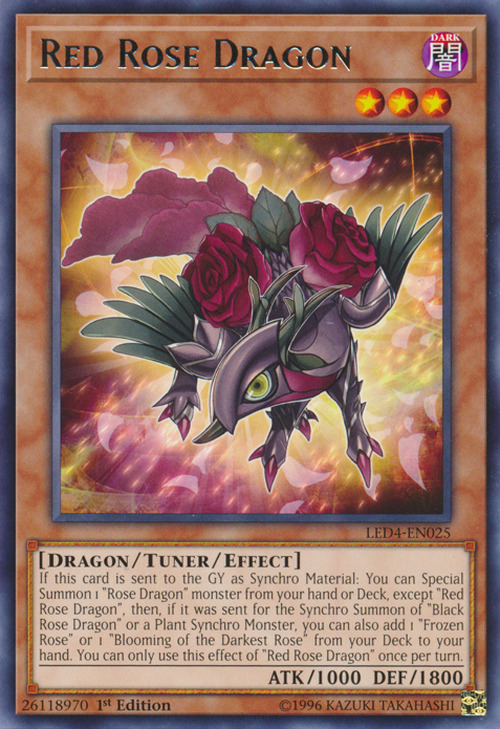 You can only use this effect of "Red Rose Dragon" once per turn. This monster appears to be an older version of Blue Rose Dragon.